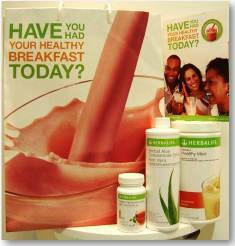 A healthy day starts with a healthy Breakfast, so get yourself your Healthy Breakfast Kit and start your day the Herbalife Way. You can't even imagine how much better you'll feel during the day when you have our Balanced Healthy Breakfast AND the best news is that it's simple, very quick to prepare and delicious to eat! Nutritional Shake Mix F1 (choice of 5 flavours), Aloe Drink- Concentrate, Instant Herbal Beverage Original 50 grams in a kit bag. When you wake up in the morning after going 10 - 12 hours without food, your energy reserves are low and your body and brain need fuel. Besides, your body has spent 1 liter of water during the night through breathing, sweating and morning visit to the bathroom. So your body wakes up “empty” in the morning and on behalf of 100 trillion cells begs you, “Hey, give me back all the nutrients, energy and water I spent in the last 24 hours”. What you choose to eat for breakfast can affect your mood, physical and mental performance, weight and your general and long-term health. Now here is the big question: What did you give your body this morning? Remember - all our bodies wake up in the morning 'empty' with normal sugar levels. What we decide to eat for breakfast will determine what will happen to our blood sugar level for the rest of the day. In the morning, simple carbohydrates (sugary refined cereals, white breads, toasts, etc.) cause an immediate surge of blood sugar level which results in the body over compensating for the extra sugar load - the excess is converted and stored as fat. The result - a decreased level of blood sugar and a craving for more carbs. This cycle then repeats itself 2-3 more times during the day. Skipping Breakfast: When you skip breakfast your blood sugar drops below the normal level. You experience cravings for food and a drop in energy. You are again tempted to revert to simple carbohydrates to achieve a quick surge of energy. Simple carbohydrates will cause an immediate surge of blood sugar level followed by the body compensating for the extra sugar load. Excess sugar turns into fat. Then this cycle repeats itself 2-3 more times during the day again. These vicious cycles constitutes one of the reasons for the development of other major health challenges and extra weight. So...Would you like to know what a good breakfast is supposed to be? Replace the energy (from proteins, carbohydrates & good fats) that was consumed yesterday, when you were active. Provide the body with all the nutrients (building blocks - proteins, amino acids, vitamins, minerals) used during the night. Maintain the blood sugar level within the normal range preventing you going into craving for "something" to eat! There are great ideas in numerous publications for a healthy breakfast BUT in today's fast paced world it's not easy to prepare a balanced breakfast that meets the four major criteria for a healthy breakfast if you don't have much time in the morning. Our Company has developed the complete and perfect Healthy Breakfast Program, helping the body with the above mentioned issues. Welcome to the easiest Balanced Healthy Breakfast - nutritious food & water in a convenient form. Disclaimer: No medical claims of any nature are made or intended in any of the stories submitted. The experiences of the parties concerned are their own personal experiences and the results obtained are due to the body receiving complete and properly absorbed nutrition on a daily basis. No guarantee is given or implied that you will experience the same results, as this depends on your adherence to the program. All nutritional programs are used with a calorie-controlled intake. © Copyright 2007. All rights reserved by the Copyright Holder, Coronet, RSA Authorised for use in South Africa only. "The name and address of the promoter is: Herbalife International South Africa Ltd. Stand 17, Janadel Avenue, Riverview Park, Bekker Road Extension, Midrand, Gauteng, 1685, SA. The goods, which are sold under this system, are nutrition and personal care products. Transactions are effected by participants.